Over the last 3 years, our church has been on a fantastic journey of re-prioritizing what’s important to Jesus…..Evangelism. No more excuses as to why we don’t or won’t !! We encourage everyone in our church family to take some of these cards home every Sunday [ we always have them in the main foyer ] and make it a priority to give them out or leave them somewhere. Simply by doing this you will be spreading or proclaiming the Words of the Gospel of Jesus Christ. If you leave it somewhere you are spreading the Gospel as if someone picks it up and watches the biblein11.com website they get a clear presentation of the Gospel. If you show them the presentation on your smartphone or spend an hour or two going through the Gospel then you are proclaiming the Gospel. 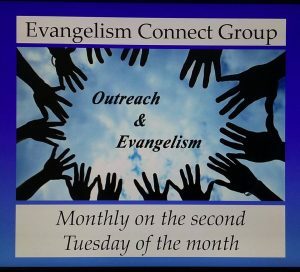 In The Oasis we believe that Evangelism is a top priority to the new testament church in line with Jesus Great Commission in Matthew 28 v 19 – 20. 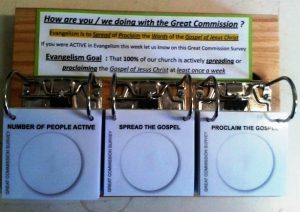 Our Evangelism Goal: That 100% of our people would be actively spreading or proclaiming the words of the Gospel of Jesus Christ at least once a week. Once you have Caught the Spark then be honest about which step you are at. Set a goal that in the next 6 months you will move 1 Step forward in being Activated. One thing we have seen is that when people set this goal and regularly evangelise from the step they are at as they get bored with the step they are at within about 6 months and want to move on to a fresh step and challenge. 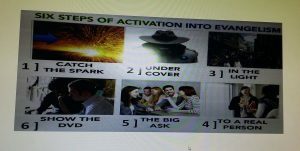 If you are regularly at step 2 it will take you about 2 years to get regularly to step 6 and that’s the growth process into Active and Regular Evangelism that is crucial for every new testament believer to be engaged in.